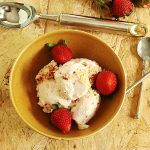 Strawberry Cheesecake Ice Cream – This ice cream tastes like the best slice of strawberry cheesecake! It is the PERFECT summer treat! Hi, can I speak to Spring? Hello, Spring!?! SPRING!!! Please baby girl, pick up, we need you! 45 degrees in the middle of May? Come on, already!
) decides to behave as it should, or not, I am still going forward with my scheduled summery recipe. Besides, ice cream is always in season. By now I really thought that this weather would be screaming for ice cream. I thought that Ana and I would be in the backyard playing in her kiddie pool, sipping on some drinks, watering the garden, and eating ice cream on the patio. My ice cream in a bowl, and hers in a cone. Not happening, yet. The recipe for this cheesecake ice cream comes from David Lebovitz’s book, The Perfect Scoop. I was just looking for a creamy ice cream that didn’t include for me to sit above the stove and cook up a custard – asking for too much? I don’t think so. I almost always skip the ice cream and make frozen yogurt, but this recipe was too good for me to pass up because you can’t talk about rich and creamy ice cream until you try this scoop of deliciousness! And just for kicks and giggles, I added some strawberries. This ice cream tastes like the best slice of strawberry cheesecake! It is the PERFECT summer treat! 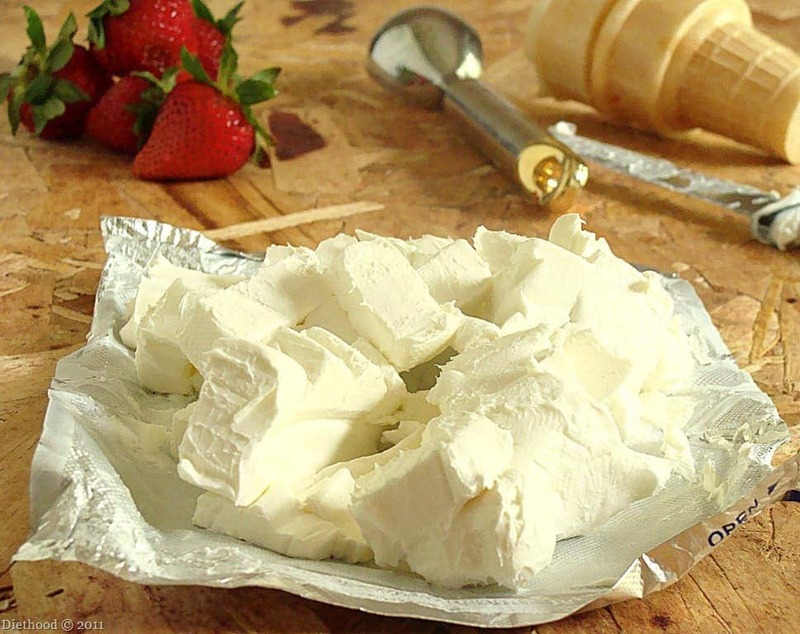 Cut the cream cheese into pieces. 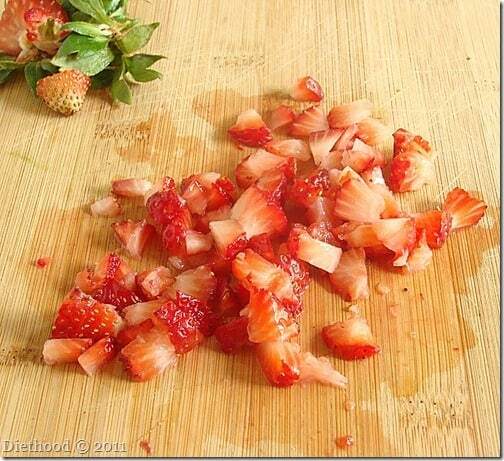 Put all ingredients, excluding the strawberries, into a food processor or blender. Put the mixture into the refrigerator to chill for about 2 hours. 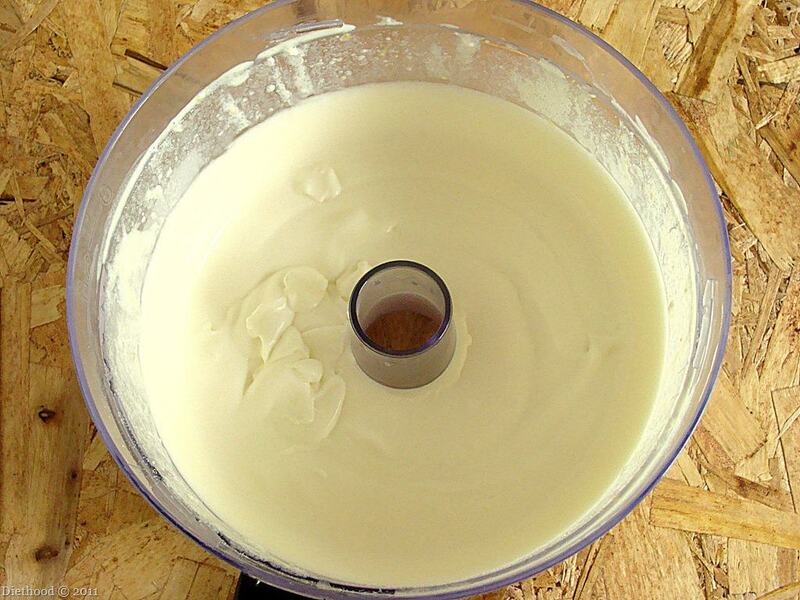 Pour the mixture into your ice cream maker and freeze it according to the manufacturer’s instructions. 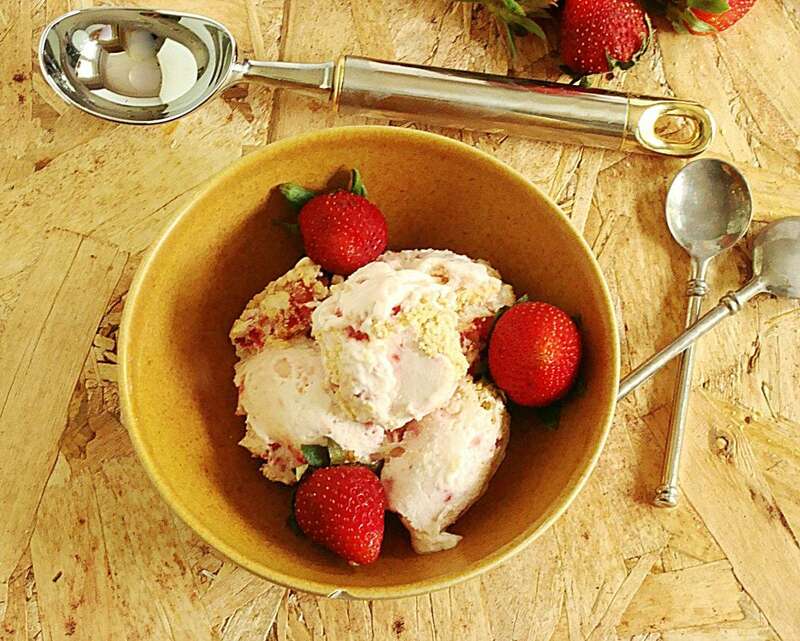 3 minutes before the ice cream is done churning, pour the chopped strawberries into the mixture through the ingredient spout on the ice cream maker. I just tried this recipe and loved it. I used sucralose, instead of sugar, and added crushed pecans but other than that the recipe was not changed. Very good, thank you. No standing over a stove? Woo-hoo!! And I just returned the book you spoke of to the library without even turning a page. Darn it all!! I have to make this recipe. What else I love about this post is that you referred to spring as bipolar. That is hilarious; and true. It’s so crazy how cold May has been, I miss hot and sunny 🙂 hopefully next month! It’s 50 degrees and raining here- but ice cream sounds like the perfect pick-me-up! I love The Perfect Scoop and the addition of Strawberries to this recipe is just lovely! God for you , Kate, for sticking to the summer plan! Can’t let the weather get you down, just because spring can’t get it’s act together doesn’t mean we have to suffer right? Superb recipe, so yummy, so summery! Congrats on the top 9, too! Yes, ice cream is definitely always in season, especially here. I am so glad that you posted this recipe because I just got my ice cream maker out yesterday thinking that I would have to make some ice cream soon. I have a beautiful punnet of strawberries and the rest of the ingredients so this was meant to be. Lovely photos too. 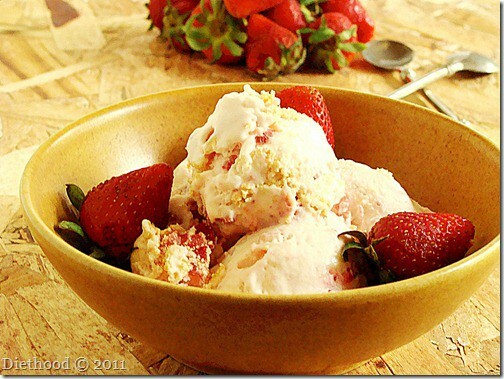 Strawberry cheesecake is one of my all time favorite ice cream flavors. The picture of the cone just taunts me…ehehehe. It’s quite warm here so this would hit the spot this weekend. Top 9! I knew these pics were spectacular!! Congrats Girl! Woohoo! Bravo on top9, Kate!! Congrats on top 9! Now I really think I need an ice cream maker! I am SOOO Glad that my hubby got me an ice cream maker for Mother’s Day!! When it finally get’s here I am making this ASAP! I had this flavor ice cream only once it my life and it was amazing! Thank you so much for sharing this recipe. I am definitely going to make this asap! The weather has been very crappy, but this is just too good to resist… screw the rain, I’ll pretend it’s summer! Is it really 45 degrees in Chi town city?!??!? WHOOLLY cow! I am sorry! 🙁 Thank goodness for ice cream! Cream cheese in ice cream is new to me but I can see how it works. My ice cream maker has been in hibernation since I moved last summer. I really need to bring it out to play. The huge chunks of strawberries are mouthwatering! Kate, this is GOOD! Simple, and no messy custard to make. Lovely guest post over at Jill’s Mad About Macarons. OMG Super yums!!! will bookmark this when i get my hands on an ice cream maker! Oh yum Kate!!! Please send some over!!! That looks absolutely fabulous!! Yum, yum, yum!! I love how you don’t have to make a custard on stove and wait for it to chill before you add it to the ice cream machine – I have no patience for that! Looks delicious! What great pictures! It could be ice cream weather any day here, this has to be the coldest spring EVER!! But it doesn’t have to be hot to eat this, yum! Somebody forwarded me this exact recipe for me to try. It looks delicious! When spring refused to come to MN – I just made spring in my kitchen – which is what you did! A sort of “I’ll show you, Mother Nature!” And this does sing of spring. I am a strawberry-fiend, cheesecake lover and will be doing this. And I keep meaning to put The Perfect Scoop on my wish-list. Your delicious photos say it all! Oh, gosh, this looks fabulous! I had my Perfect Scoop cookbook out yesterday, but put it back since it wasn’t ice cream weather. Tomorrow looks promising…fingers crossed for warmth and sunshine in Indiana! I’m not much of an ice cream fan, however, every once in a while one catches my eye… and this one sure did! 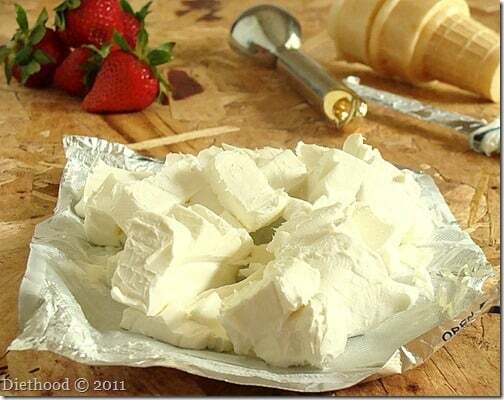 I thinks it’s the “cheesecake” part that did it, but we will definitely be trying this one!! Lovely, lovely photos too! I cannot overstate how much I LOVE the light in these photos! How do you eat all this and stay so svelte? You must post your secrets, my lovely! i’ll take 2 scoops on a cone, please!! I am going to hunt down my ice cream maker and get this party started. OOoooooooh…..I am trying not to literally drool all over my keyboard right now. So good. Btw, so much in common? I know! I think we might be linked at the brain. Teething means everyone needs a little creamy treat. This is perfect. I need an ice cream maker. It’s officially added to my list. It’s pretty and pink too, which I love. Being surrounded by boys all the time …I could use a little more pink. Making this, making this, making this! I’m dancing with joy! I’ll need to get more strawberries at the farm over yonder but I can do that and I have all the rest of the ingredients. Strawberry cheesecake ice cream is my absolute FAVORITE. Yours looks perfect; delicious; wonderful. They say that tomorrow summer returns (here at least). I’ll be ready. Oh, I love cheesecake ice cream, it’s the best! I’m still waiting on spring here on the coast too! Nothing but rain for the past week! Kate, your photos are just too mouth-watering. I want that ice-cream! 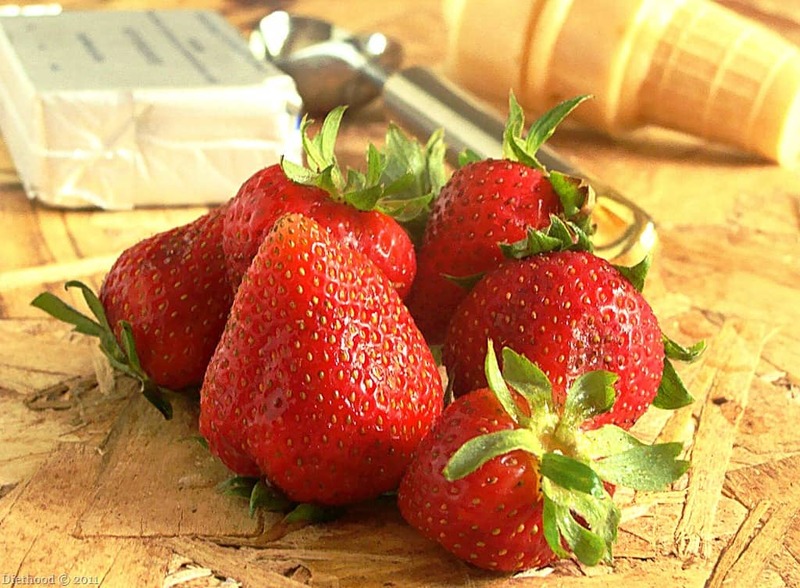 Cheesecake and strawberries: what more could we ask for (apart from the sun)? I see tons of ice cream recipes on blogs! I already wanted an ice cream maker but now I NEED one! This ice cream must be delicious with the cream cheese & strawberries! What a great recipe!!! Looks fabulous!! Wow…I can’t believe how simple this is! No custard!! 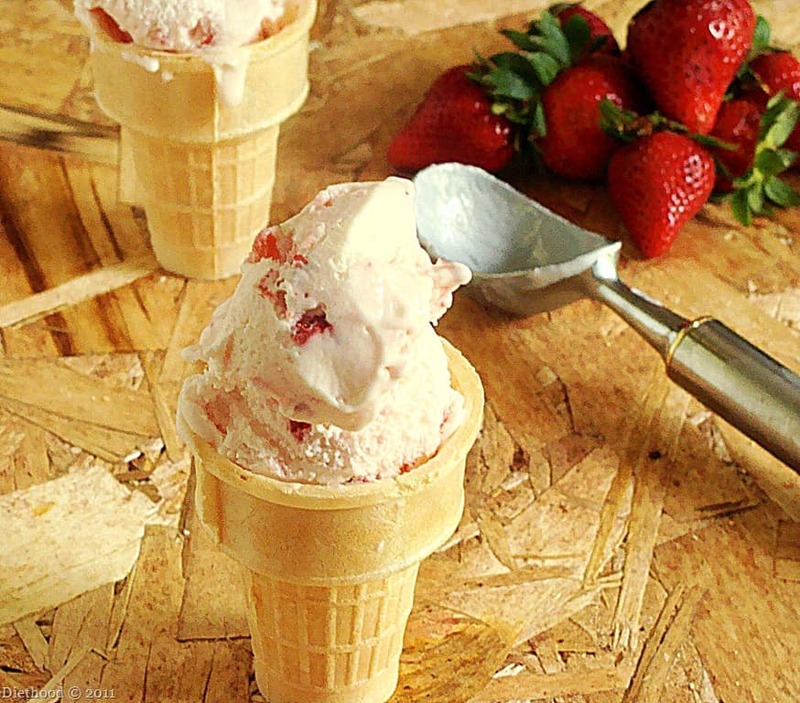 Looks really great…I recently made a strawberry cheesecake ice cream but it wasn’t creamy and got way too hard 🙁 I’ll have to try something more along these lines. And I”m with you on the weather…even here in California it has been abnormally chilly.